To give a flavor of this little country, I will note as we travel, different aspects of the Slovenian culture. The language Slovenian they call Slovenščina. Here is the Slovenian alphabet which adds three extra letters Č č [spoken like 'ch' in "chocolate,"] Š š [like 'sh' in "shock,"] and Ž ž [like 'su' in "pleasure" or 'ge' in "garage"] and deletes four letters: Q, W, X and Y. The letter J is pronounced like the 'Y' in "Yankee." Below are the names of the months in Slovenian. January is Januar and December is December. The days of the week are: Monday is Ponedeljek (day after Sunday,) Tuesday is Torek (2nd day,) Wednesday is Sreda (middle day,) Thursday is Četrtek (4th day,) Friday is Petek (5th day,) Saturday is Sobota (sabbath,) and Sunday is Nedelja (no work.) Counting from one to ten is en, dva, trije, štirje, pet, šest, sedem, osem, devet, and deset. 100 is sto and 1000 is tisoč. Who, what, why, when and where are: Kdo, Kaj, Zakaj, Kdaj and Kje. Two important words are "please" which is prosim, and "thank you" which is hvala. 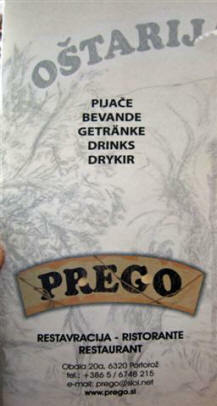 Another useful phrase is "a beer please" which is pivi prosim. Hello is "Zdravo" and Good-bye is "No svidenje." Now, the big issue is how to pronounce all those words with no vowels, e.g. "trg" or "vrt (garden.") Just pronounce a slight "uh" sound before the "r." So it would sound like "turg" or "vurt." Easy, huh? 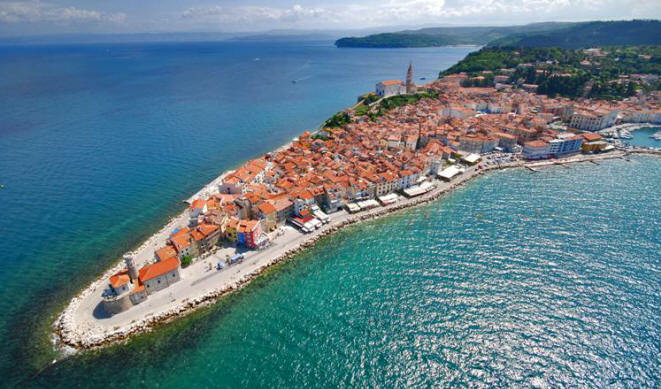 My original plan was to stay only one night in Izola, but because the hotel was so nice and situated in such a beautiful spot as well as reasonably priced, I asked them if we could stay another night. I was happy when they said we could. I woke at 4:40 and again at 6:15 and forced myself to get up at 6:20 to beat the heat which I didn't completely do yesterday. 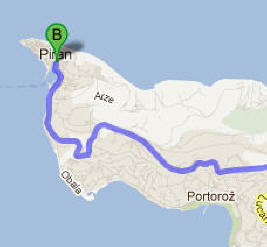 By 6:45 I was repeating my run along the beach and then into town. The weather was just right for running. I went directly back to the room at 7:20 and went back to sleep. I woke at 9:20, 10:45 and then Marcia woke me up at 11:30 so we could get out of the hotel on time. He is very good at taking good care of hotel guests and young people might say "he's a cool dude." Thanks Andrej and Annja (right) for our warm welcome to your country. They should get a raise in salary in our opinion. Later I started responding to Booking.com's requests to rate our stays at the hotels we booked. I gave Marina Hotel an excellent rating. Now that we were checked out and our bags were down, I had time to relax and get another cappuccino in their lobby area and use their free WiFi to get my email, book a hotel, download Rush and get the puzzle. This was relaxing. On my way back to the hotel, near the marina, I noted that they have boat excursions available to go from Izola to Piran and Portoroz. Should be a nice trip. 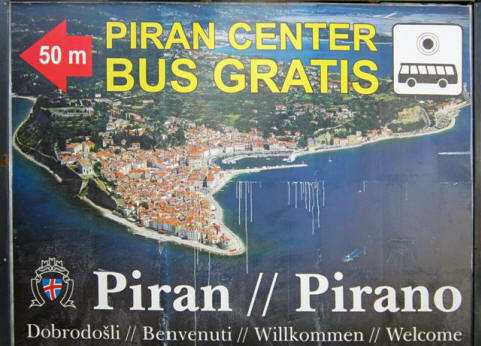 We loaded the car and at 2:35 Marcia drove the 6.8 miles (11 Km) heading to our next city, Piran. 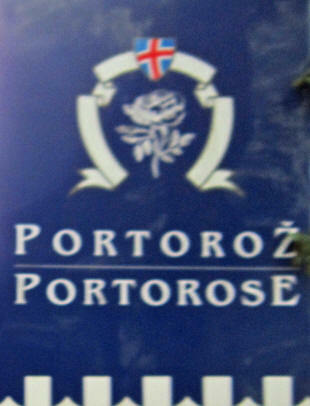 We wanted to the famous resort town so, at 2:50, we arrived in Portorož (Italian Portorose) and found a parking spot on the street along the beach. She parked a little on the sidewalk to be safe. We crossed the street and arrived in this grassy park along the seashore. Some people had tents up. ...with a beautiful view of the Adriatic Sea. She had a coke zero (above) and a tuna salad (below left) which came with a basket of bread, both of which she enjoyed. I broke my fast and had a refreshing limone (lemon) gelato. When I went to the men's room there were these interesting charcoal drawings of local fishermen on the walls. As we walked back to the car, I shot this panorama of the tourist beach area. 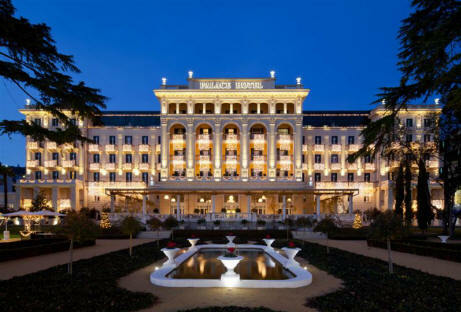 I zoomed in on the palatial Palace Hotel [Obala 45, +386-5-692-7000.] 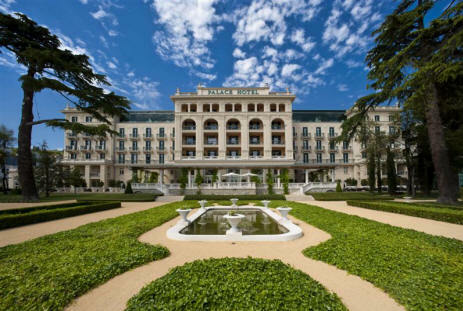 It is a Kempinski hotel along the beach and it sure looked pretty ritzy. I can imagine the room rate is not inexpensive. 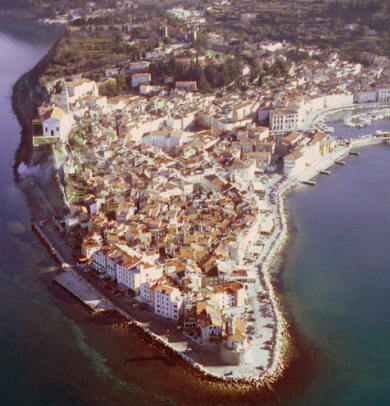 We walked back to the car and at 4:10 Marcia drove the remaining 10.3 miles (11 Km) to the ancient city of Piran located at and taking up the entire tip of a sharply pointed peninsula. Haven't seen anything like this since Trapeni in Sicily in 1997. Here (above & below) are some aerial photos I found of the peninsula. Above right you can see the main square (right center) leading to the marina (below) and the church up on the hill (upper.) They do not let you drive into the city unless you are checking into a hotel. So with our official pass from the police at the guard station on the road in, they let us drive into the old city (red line on map along the right side of the marina) in an area just near the hotel entrance and at 4:30 we checked into Hotel Tartini Vlad, [Tartinijev Trg 15, +386-5-671-1000.] Our hotel is the tile roof at the bottom of the photo below left, and the place I parked is that marked out by the alternating red and white plastic barrels. Below right is the hotel lobby; not fancy. Once we got our bags into our room (#208,) at 4:45 we now had to drive our car to their city parking garage outside of town and leave it there. As you have guessed, the city is totally pedestrianized. We retraced our path as directed back out of town and then into the top floor of this large parking structure (below right) built against a hill. Where Marcia parked, she couldn't get out on her side, so she had to climb across into the passenger side to get out (more on that tomorrow.) At our age, this is not as easy as it once was. We thought we were on the ground floor since we had driven onto the first floor from the road. Now we had to take their modern elevator down to the real ground level (stairs in photo above right.) There are plenty of signs directing you where to go. After you climb down those stairs, you wind up walking down this non-descript alley. Thank God they had this large billboard saying go left at the end. As we turned the corner, we arrived in this area of flat land near the sea and we headed to this little bus stop enclosure under the tree. At 4:55 we started waiting for the free bus to take us back into town. Below right is the view of the coast from here. We didn't have to wait too long before the bus arrived. The bus was modern and clean. It was a pleasant 15 minute ride back to our hotel. It dropped us off right at the hotel door. Once in the hotel, we had the choice of the circular stairway up but we chose the elevator and when we got off, we saw the patio bar area outside the 2nd floor. The hallways are all yellow and our room wasn't too bad. The bathroom was also quite suitable and clean. We decided to go walk around and see the town. At 5:15 we stopped in the Tourist shop and Marcia had to buy a T-shirt for one of our grandchildren. 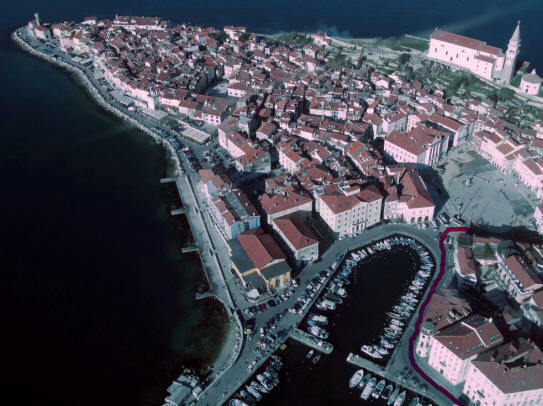 The main plaza of Piran is very large and is called Tartinijev Trg. It was built in 1933 with a central monument to their favorite son, the musician Giuseppe Tartini. Here are two views from each direction; below is looking west from our hotel. See the little red building in the far center? Below is a closer look at the classic architecture. On the right are the structures next to it. Here is the view when you turn around from that building and look east (below.) Our hotel is just behind the two large polls. I headed down one of the streets leading toward the tip of the peninsula and came across an open vegetable market. As you go deeper into the old town there are many archways and some of them have housing over them. 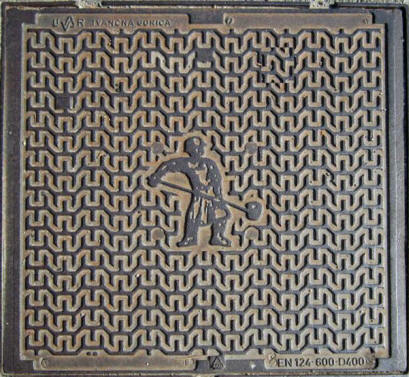 Here (below) is one of their manhole covers. Then I came across this Mozaik (Mosaic) shop and peeked into to see the man working. 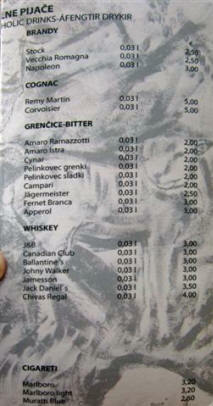 I looked at my Slovenia tour book for awhile (below left) and texted Marcia to come and join me for a glass of wine. When she got there I moved to the outside patio area with her which was a lovely spot to relax. 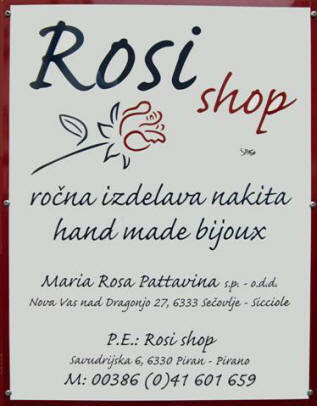 After we sat there for a while, we picked up and headed back to the hotel and at 6:15 Marcia stopped and bought a little necklace at a place called Rosi Shop. We were planning to sit outside but it started to sprinkle a little so we went inside. There was only one person taking care of things and thus it was lucky we were the only people in the place. Marcia enjoyed another Raznjici [Raz-knee-chi] which came with roast potatoes and the ubiquitous combo of chopped raw onions and red pepper sauce. Our waiter than felt we each deserved a free glass of grappa. We were having (as usual) a very good time. The whole dinner cost us €39 and we rated it as Good. We leisurely walked back to our room at 11:30. I then read the 910 lease and went to bed.